We die for the still very en vogue Beni Ourain rug, of course, and, since we like to read, we're totally down with the over-sized book/magazine rack next to the bed. The leather patchwork bed frame is organically evocative and we can even appreciate the absurdly self-conscious absurdity the photograph of Jeff Koons's porcelain sculpture of Michael Jackson and his monkey, Bubbles, lends to the whimsically curated, compact, and slightly cluttered space. We even sort of get the cemetery location or, at least, are reasonably amused by the Tinseltown macabre of it. What we can not understand, firstly, is how a person, especially one who has, say, a handful of gin & tonics in their belly, is supposed to get in or out of the bed let along sleep soundly with all the crap and tchotchke pushed right against the edges. And, secondly, we absolutely can not abide the custom paint-by-numbers wall mural. The paint-by-numbers motif is, in itself, fine. Maybe it's a little bit yesterday but, still, it's okay. The decorative disturbance for Your Mama is the giant, white letters that read YOLO, which all the texting and hashtagging children know is the ubiquitously trendy acronym for You Only Live Once. Sorry, James, but, no. Seriously, no. Puke, in fact. Great little room, but ... in a damned cemetery? No. On a bright note, Mama and LGB/LB, remember this ('08) blast from the past?! is is true that Kimmy K FATASS is buying dr dre lot in hidden hills????? 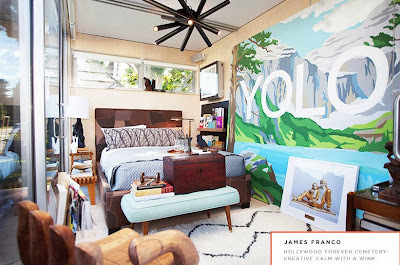 Only James Franco would consider it humorous to paste YOLO on the wall of a room in a cemetery. I just don't get Spike Lee. Evertime a white person does something, he has to make a comment that African-Americans are not included. Now, it's time to sell his house, and although, Spencer Means, of Corcoran is his wife's good friend and there are a thousand pictures of them on the internet, Spike gives a $32MM listing to a white woman. He doesn't even consider a co-listing with this black man. It's all about the dollars. But when Clint Eastwood did a film on Jazz, he complained that a white man can't do Jazz, when Quentin Tarintino did Django Unchained, he complained about the use of the N Word, when Clint Eastwood did a WWII movie, he complained no African-Americans - Now he has to sell his house --- immediately, not one African-American Broker, no uplift the race, no, let's give a black man a chance, just right to the stereotypical White woman upper east side broker. So sad!